^ a b Johnson, B. Christopher; et al. (1999). "Substantial UV-B-mediated induction of essential oils in sweet basil (Ocimum basilicum L.)". Phytochemistry. 51 (4): 507–510. doi:10.1016/S0031-9422(98)00767-5. ^ Baritaux, O.; Richard, H.; Touche, J.; Derbesy, M.; et al. (1992). "Effects of drying and storage of herbs and spices on the essential oil. Part I. 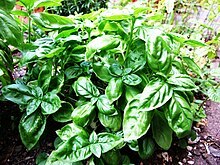 Basil, Ocimum basilicum L.". Flavour and Fragrance Journal. 7 (5): 267–271. doi:10.1002/ffj.2730070507. ^ Miele, Mariangela; Dondero, R; Ciarallo, G; Mazzei, M; et al. (2001). "Methyleugenol in Ocimum basilicum L. Cv. 'Genovese Gigante'". Journal of Agricultural and Food Chemistry. 49 (1): 517–521. doi:10.1021/jf000865w. PMID 11170620. ^ Fandohan, P.; Gnonlonfin, B; Laleye, A; Gbenou, JD; Darboux, R; Moudachirou, M; et al. (2008). "Toxicity and gastric tolerance of essential oils from Cymbopogon citratus, Ocimum gratissimum and Ocimum basilicum in Wistar rats". Food and Chemical Toxicology. 46 (7): 2493–2497. doi:10.1016/j.fct.2008.04.006. PMID 18511170. ^ Pessoa, L. M.; Morais, SM; Bevilaqua, CM; Luciano, JH (2002). "Anthelmintic activity of essential oil of Ocimum gratissimum Linn. and eugenol against Haemonchus contortus". Veterinary Parasitology. 109 (1–2): 59–63. doi:10.1016/S0304-4017(02)00253-4. PMID 12383625. ^ Bomford, Michael (May 2009). "Do Tomatoes Love Basil but Hate Brussels Sprouts? Competition and Land-Use Efficiency of Popularly Recommended and Discouraged Crop Mixtures in Biointensive Agriculture Systems". Journal of Sustainable Agriculture. 33 (4): 396–417. doi:10.1080/10440040902835001. Archived from the original on 18 September 2016. Retrieved 17 September 2016. ^ Maurya, Prejwltta; Sharma, Preeti; Mohan, Lalit; Batabyal, Lata; Srivastava, C.N. ; et al. (2009). "Evaluation of the toxicity of different phytoextracts of Ocimum basilicum against Anopheles stephensi and Culex quinquefasciatus". Journal of Asia-Pacific Entomology. 12 (2): 113–115. doi:10.1016/j.aspen.2009.02.004.